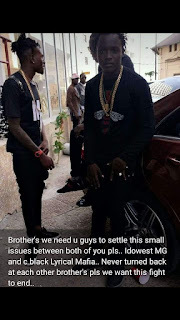 There have been an underground quarrel amongst fans on Lagos Island as Idowest and C Black goes on head to head on who should take on the leadership of popular Music group called Mafia Gang. The Mafia Gang group is a group which rose after the untimely demise of late Da'Green. It consist Idowest, C Black and Abramsoul and lead by the fore with a queen called Arewa Mafia (she doesn't sing but holds the group like commando). It was the biggest and still remains the most valuable music group on Lagos Island. But when Idowest got signed to World Star Music and later into Davido Music Worldwide (DMW) the leadership is expected to change to the next valuable player who is C Black who later got signed to Trap Niggas Records (TNR) around July 2017 but with no clear news on the label. Expectedly, Abramsoul is suppose to be next in command, which will leave him with absolutely no team member and trying to recruit another crazy talents but then C Black never left the Lagos Island, he stayed closer keeping him in position. Idowest left to Lekki with the DMW crew, only visited once in a while due to celebrity status risen. With confusion on who will keep 'Isale Eko' alive since Vector is also now a visitor and Sleek DJ Mayz is out at Nairobi, the people are in panic. It must be recalled that this fight for leadership goes way back as C Black have always feared Idowest will forsake the group which they worked very hard to birth. When Idowest left and after TNR, C Black tried changing the name Mafia Gang to World Star Mafia, just to make it sound international, but that didn't go well as he now flashes WM/ Cash "N" Out. Now here comes the most confusing part, if Idowest and C Black leave the group, how will Abramsoul start? Can he he stand alone? Is there another Group close to Mafia Gang on Lagos Island that can give proper entertainment for over 1hour?